It has the appearance of a marble, but doesn't etch like marble can. After sealing, quartzite is very resistant to staining. It won’t fade from exposure to bright light or sunshine, as can happen with man-made “Quartz.” And like all natural stones, quartzite is perfect for kitchen use because it is heat-proof. Quartzite’s look is timeless and beautiful. There is no mistaking that it is real stone, with a unique veining pattern only nature could create. Each one-of-a-kind piece of quartzite has the appearance that artificial stone tries to imitate. Actually, it is difficult to find a down side with quartzite, other than the fact that it is so hard, the homeowner’s choice of edge profile is limited, and that its high absorption rate means a good-quality sealer is necessary. But because its porosity is so easily overcome with today’s outstanding stone sealers, the only remaining disadvantage is cost. 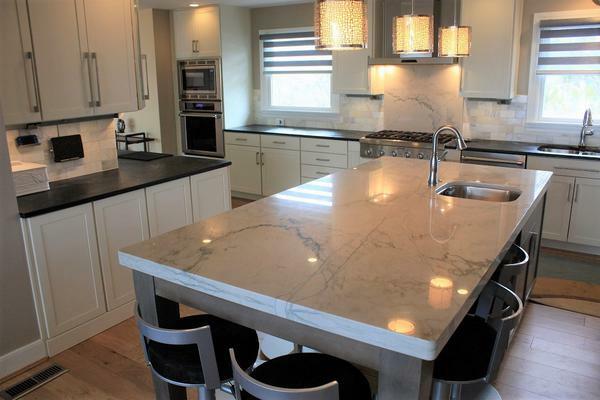 Quartzite is a high-end material that looks and acts like a high-end material. 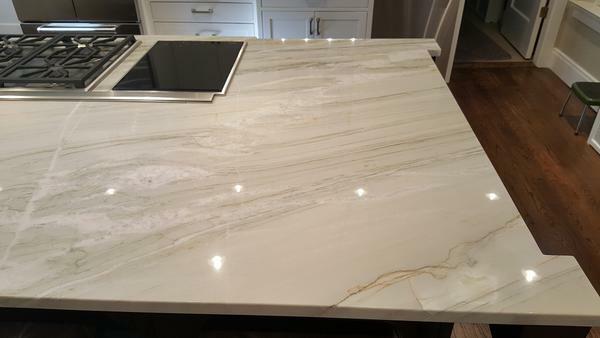 Click here to see our current quartzite inventory. For more information about natural quartzite, check out Wikipedia.